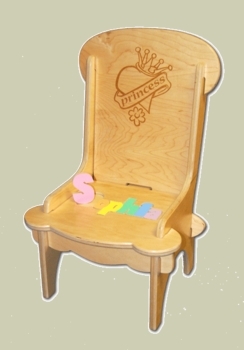 Intended for little girls, this Personalized Children Chair is constructed from durable maple hardwood and measures 28� tall by 17� wide. The chair will arrive un-assembled. No tools or added hardware are needed for the easy assembly. Letters for child's name are removable from the seat (8 letters max), and a personal message can be engraved on the back. See More Images for more pictures of this product and the butterfly design.